Dixon is thrilled to have debuted the Limited Edition Motion Blue Burst 3-piece kit at Winter NAMM 2017. 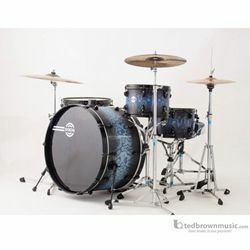 The Limited Edition Motion Blue Burst kit features a unique electric finish that moves. As the audience moves around the kit the finish presents a lava lamp motion effect. The finish is complemented with black hardware, creating a one-of-a-kind look. 14” x 24” Bass Drum.